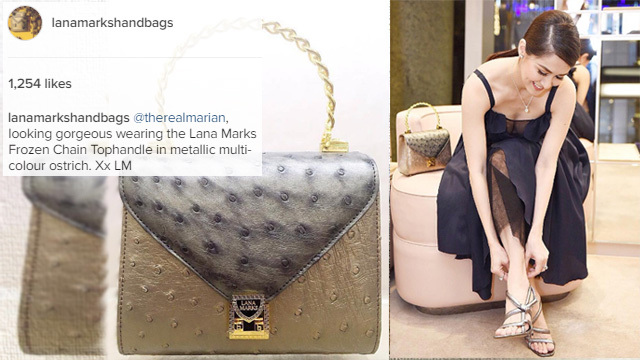 Kapuso actress Marian Rivera who is known for collecting luxury handbags, accessories and shoes is now the first Filipina to own a Princess Diana Handbag. The Primetime Queen posted on her instagram account 2 weeks ago her Outfit of the Day with her Handbag. When the International Brand Designer noticed it, she decided to give her a new one with a letter that it will be an addition to her wonderful collections. Lana Marks is known for its exotic leather accessories and is one of the most expensive handbags in the world based at Palm Beach, Florida. It is mostly carried at the Academy Awards Red Carpet by Hollywood Actresses such as Angelina Jolie, Charlize Theron, Reese Witherspoon, Jennifer Aniston, Lucy Liu, Kate Winslet, Jullianne Moore, Charlie Theron, and Helen Mirren. The CEO and Designer of Lana Marks is also known for being friends with Diana, Princess of Wales. Meanwhile the 32-year old new mom recently celebrated the 1st birthday of her child with her husband Dingdong Dantes, Maria Letizia last November 23. According to them, they wanted a simple celebration because Baby Zia won’t enjoy a party and will not remember it. Their family went at Sonya Garden where the couple had their first date 8 years ago. Marian gave a birthday message for their child where she wrote that they love her so much. She is hoping that she will grow up a good person and love other people. She is also thankful that she got to breastfeed her for a year. Dantes also gave her wife and daughter a painting with a sweet message that he will never forget the sacrifice that Marian did for Baby Zia and he is so proud of her. It was also like Dingdong’s birthday because of the success of his latest movie “The Unmarried Wife”.